We've got an unusually large number of awesome deals today, with everything from games and movies to HDTVs and digital cameras at serious discounts. So let's cut to the chase, shall we? • Left 4 Dead on Xbox 360 for $43.99 (normally $59.99). • Batman: Arkham Asylum on Xbox 360/PS3 for $36 (normally $48 - for pre-order only. Use coupon code WBSURVYJ9). • Grand Theft Auto IV for Xbox 360 for $27.99 plus free shipping (normally $39.99). • Xbox 360 Wireless Controller for $31.99 plus free shipping (normally $49.99). • Xbox 360 Wireless Network Adapter for $69.99 plus free shipping (normally $99.99). • Philips 42'' 1080p LCD HDTV for $698 (normally $899 - in Target stores only). • Westinghouse 47'' 1080p Widescreen Ultra Thin LCD HDTV for $769.99 plus free shipping (normally $1,098.90). • Sony Bravia 52'' 1080p LCD HDTV for $1,379 plus free shipping (normally $2,299). • HP Smart Buy 17'' LCD Monitor for $49.99 (normally $119.99 - use rebate forms here and here). • Toshiba 320GB Internal Hard Drive for $62.99 plus free shipping (normally $99.95). • Brother All-In-One Monochrome Laser Printer for $109.99 plus free shipping (normally $189.99 - valid today only). • IBM ThinkCentre A50P Pentium (refurbished) for $134.99 plus free shipping (normally $174.99 - use coupon code EMCLNMV34). • CORSAIR Flash Voyager 8GB Flash Drive for $9.99 plus free shipping (normally $29.99 - use this rebate form). 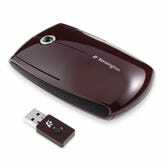 • Kensington SlimBlade Media Mouse for $19.99 (normally $29.99). 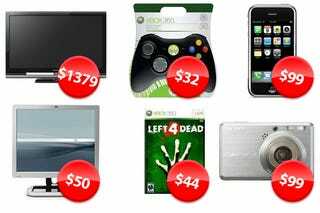 • iPhone 3G 8GB for $99, 16GB for $199 (refurbished) plus free shipping (normally $199-299). • Garmin Nuvi GPS Navigation Ssytem for $99.99 plus free shipping (normally $129.99). • Sony Cyber-shot 8MP Digital Camera for $99 plus free shipping (normally $161.41). • 1-Year Domain Name Registration for $1.19 (normally $9.99-14.99 - use coupon code LOVE99). • Pirates of the Caribbean Trilogy on Blu-ray for $48.99 plus free shipping (normally $82.99). • Iron Man Ultimate Two-Disc Edition on Blu-ray for $18.99 (normally $39.99). • Tropic Thunder (Unrated Director's Cut) on Blu-ray for $18.99 (normally $39.99). • Starbucks VIA Ready Brew (Instant Coffee) sample for $0. • Huggies Soft Skin Baby Wipes sample for $0. • VIVA Towels sample for $0. Save $300 on a Sony® BRAVIA® HDTV. Turn your 1040 into 1080p from Sony.